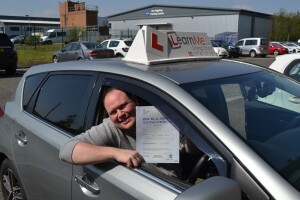 Huge congratulations to Adam from Renfrew, after passing his practical driving test at Paisley driving test centre. An absolute pleasure to see him pass after a great drive. Was great being on lessons with him, an absolute gentleman, and although disappointed not to have the pleasure of his company while driving again, it gives me great satisfaction to know it’s because he passed and will be driving himself. Safe driving for life in and around Renfrewshire.